It’s been a while since i posted a Tasting Note , mainly because i haven’t had anything new to taste ! I haven’t been buying a lot , make that anything . I’ve been passing on a lot of the recent special releases due to either price ( i’m not prepared to pay stupid prices ) , previous releases being below standard ( The Perprtuum springs to mind….) or Both ! 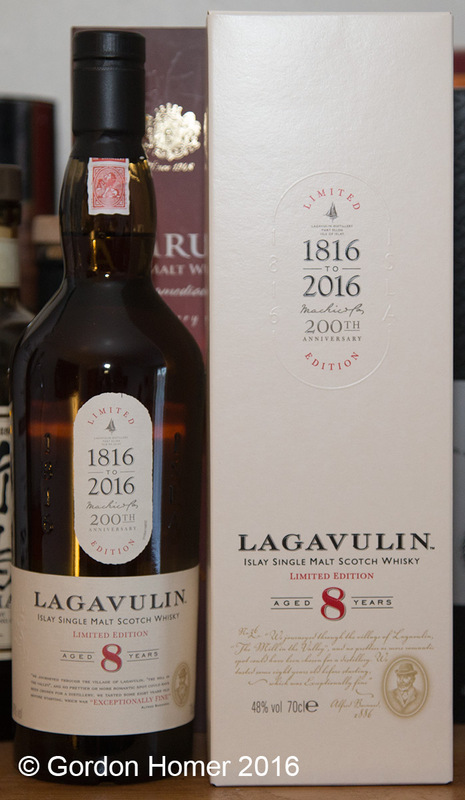 So when a reasonably priced special release comes along i jumped at it……..
Bottled at 48% , this is a young Lagavulin , 8 years young or as Pinkie used to refer to it in his warehouse tastings ‘Baby Lagavulin’ , there was always an 8yo on Iains tour , usually sherry cask , but it was usually a front runner on the tasting . This is very light , Very pale straw , lots of lovely legs in the glass . The nose was initally very young but left to open up it soon got peaty and smoky , there is also strong lemon citrus and malted barley . It’s not one of those noses you can sit and linger on , it demands to be drunk ! The palate isn’t overwhelming for it’s youthfulness , it’s quite dry , it’s quite peaty , it also reminds me of a certain lemon throat sweet , there’s a nice peppery spiciness to it . The finish is medium with a pepperyness . I tried it with a bit water and on the nose it brought the lemon out forward . On the palate it fetched the spices out . This is a pretty good dram , you’ll be more than happy if you are an Islay Peet Heed ! 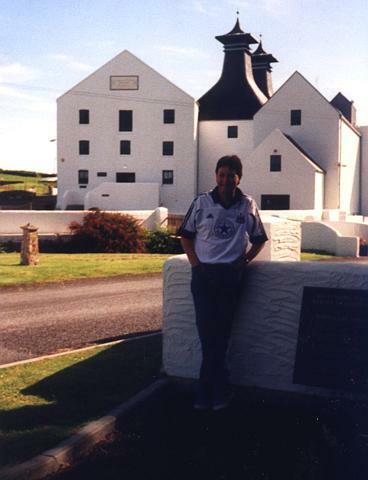 I wanted to try it up against something of a similar age from the distillery and the only thing i could find was was the Elements of Islay Lg2….. This is a whole 10% abv higher than the 8yo , The nose is pretty much the same , peaty smoky , lemon , etc etc , the palate packs a much stronger kick but is pretty much the same again . There isn’t much to chose from between the two apart from the extra ABV . Who ever approved this beast of a Laga must have been extremely knowledgable about Islay and it’s malt and must have a very good palate for these things , could also be a pretty good looking chap , intelligent as well………. I did enjoy a good chat with Ollie on the Elements table and sampling some of his drams and it was nice to see Erik and Laura on the Wemyss Table . As i sit here writing this i’m enjoying a 1978 Ardbeg Distillery bottling , lovely stuff and to think it was half the price of the new released Dark Cove when originally released , how times have changed……. One thing i have been doing a lot – especially since our trip to India and my recent health scare – is enjoying a good pot of tea . Luckily there is quite a lot of quality Indian tea available , i’ve been shipping some in from a couple of companies in India , Golden Tips and Tea Box , Golden Tips does my favourite , a Glendale Twirl Nilgiri Black Tea – absolutely delicious . Twinings do a similar one , a Nilgiri Twist Glendale Estate , both are SFTGFOP1 grade and it makes a great difference ! I prefer Nilgiri (Southern India) Tea but i’ve had some excellent samples from Assam , Darjeerling and even from Nepal (Samal and Antu Valley) . I prefer Black tea but the only green one i’ve really enjoyed was an Organic Avaata Supreme Nilgiri Green Tea . It’s certainly more fun Discovering Tea at the moment than Whisky……..